Follow-up to the statement issued by the ministry on the registration of cases of respiratory Middle East Syndrome (Corona) on January 28, 2019 the number of registered cases reached to date five cases, resulted in two deaths, while the rest of the patients receive the necessary health care in one of the reference hospitals. The ministry extend its sincere condolences to the families of the deceased. Also apply them to members of the community thanks for their cooperation and understanding of the precautionary measures taken to ensure their safety and reduce the spread of infection. The Ministry of Health confirms the continuity of its efforts to monitor and control the disease and limit contacts and follow-up of their health. The ministry calls upon the need to take the information from its source, also urges citizens and residents of commitment to prevention and infection control healthy habits and procedures when sneezing and coughing. Six days ago Oman's Ministry of Health announced 4 MERS cases (with no details provided), while yesterday the UAE Embassy in Muscat issued a cautionary statement via their twitter account to nationals living in Oman, which suggested there might be more information forthcoming. 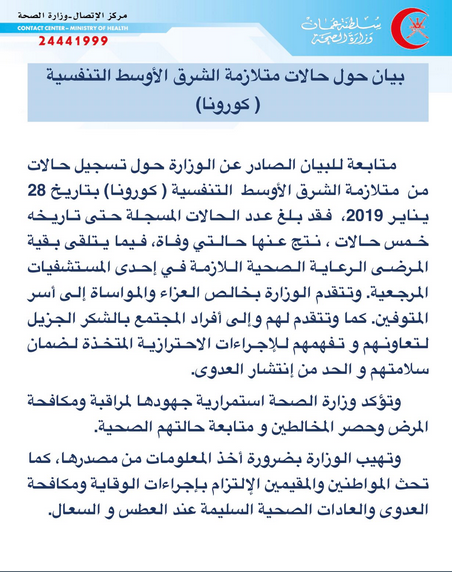 Today Oman's MOH has tweeted the following brief update (in Arabic) which increases the number of MERS cases from 4 to 5 and announces 2 deaths. 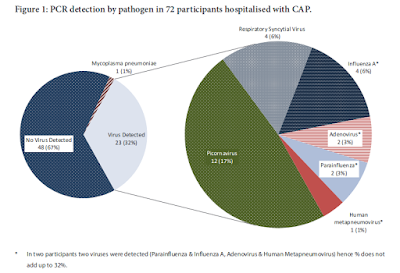 CONCLUSIONS: The number of cases registered with the Middle East Respiratory Syndrome (Corona) was 5 cases resulting in two deaths until 28 January. The Ministry of Health, through its account on "Twitter" that the rest of patients receive the necessary health care in a reference hospital, and is continuing to control and control the disease and the confinement of contact and follow up their health. We still have zero details on these cases, other than the number of cases and deaths. Hopefully we'll get a WHO update in the next few days that will shed some light on Oman's largest reported outbreak to date.